FishEaters Traditional Catholic Forums - How's That Ave Maria Community Going? FishEaters Traditional Catholic Forums > Church > Catholicism > How's That Ave Maria Community Going? Full Version: How's That Ave Maria Community Going? I read something about it recently. Not nearly as many people have bought homes there as was expected. The location seems to be a problem, being kind of out in the boondocks. I think the article said it was half an hour from the next nearest town, which doesn't seem that isolated to me but apparently it does to many prospective homeowners. Of course the media could be just giving it a negative spin; they're not exactly friends to Catholics. That was it! I couldn't remember where I read it. (06-05-2009, 10:44 PM)BrevisVir55 Wrote: [ -> ] I knew that there were issues with the community and university in the beginning but I haven't heard anything else in a long time. Does anyone know how the community and university are going now? Seems like an interesting concept. Ask the owner of the AngelQueen forum. He lives close by. On the plus side they now have the Traditional Latin Mass every Sunday and I believe on week days also. I used to live in FL. Ave Maria is taking giant steps into the past. We need to implement Vatican II. We need to be more involved with Faith & what Jesus taught rather than who can wash the dishes or serve around the altar. Ave Maria is circa 1940's. Oooh, I'm ready to pack me bags and move! 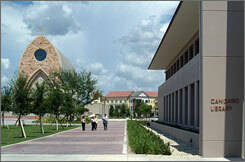 Am I the only one who thinks the Ave Maria cathedral looks hideous? (06-06-2009, 02:54 PM)Carthusian Wrote: [ -> ] Am I the only one who thinks the Ave Maria cathedral looks hideous? No. It's like a marriage gone wrong between Gothic and Oral Robert's Christ's Chapel. . Personally, I have concerns about who holds the reigns over such a situation. Ideally, it should be a committee of orthodox priests and bishops. In this case, it seems to be a layman who can yank the purse strings in any direction he wants. It's the equivalent of a "Parish Committee" that basically runs the parish and tells the priests what to do. Nothing good has ever come of that at Novus Ordo churches, so I can't see anything good of it coming here either.